Occupying a special place in the imagination of engineers and producers, the 1084 delivers an incredibly fat, smooth sound. While the 1084 builds on the same basic design of the world-famous 1073, it offers a significantly different palette of frequency selections. The 1084 also features a “Q” switch, allowing the user to choose between two different Q types, either narrow or wide with respect to the parametric band. These added features and the 1084’s extended versatility make it a preference over the 1073. The 1084’s three EQ bands provide selectable frequency, with cut and boost capability, and a mid-frequency band which benefits from a High Q Presence switch. The high pass filter can be switched between 45Hz, 70Hz, 160Hz & 360Hz, and the low pass filter between 6kHz, 8kHz, 10kHz, 14kHz, & 18kHz. Both boast 18dB per octave slopes. Handcrafted and completely hand wired in Burnley, UK by Neve’s dedicated professionals, the 1084 reissue has been reproduced to the exact specifications of the original modules. Where innovation has improved on previous technology, Neve has welcomed such improvements. However, not all things lend themselves to enhancement. Example: audio transformers. While other manufacturers use replacements, AMS Neve alone has access to the original hand-wound transformers. This is an important factor when you consider that an analogue preamp is only as good as its transformer. That is why only a Neve sounds like a Neve. 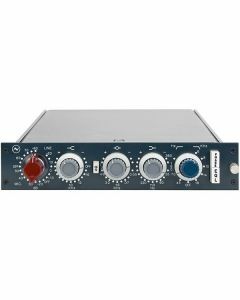 All Neve mic preamplifiers are designed to accept signals from a wide range of microphone and line sources. Uncompromisingly low noise and distortion with generous overload performance are noteworthy hallmarks of all Neve products. Output: Maximum output >+26dBu into 600 ohms. Output impedance is 75 ohms @1kHz. High Frequency: Smooth +/-16dB shelving with selectable frequencies of 10kHz, 12kHz and 16kHz. Low Frequency: Smooth +/-16dB shelving with selectable frequencies of 35Hz, 60Hz, 110Hz & 220Hz. Mid Frequency: Smooth +/-12dB or +/-18dB peaking with switchable 'High Q', selectable centre frequencies of 0.36kHz, 0.7kHz, 1.6kHz, 3.2kHz, 4.8kHz & 7.2kHz. Low Pass Filter: 18dB per octave slope, switchable between 6kHz, 8kHz, 10kHz, 14kHz, & 18kHz. Microphone Input: Input impedance 300 or 1200 ohms, gain +80db to +20dB in 5dB steps. Line Input: Input impedance 10k ohms bridging, gain +20dB to -10dB in 5dB steps. Output: Maximum output is >+26dBu into 600 ohms. Output impedance is 75 @1kHz. Output is transformer balanced and earth free. Distortion: Not more than 0.07% from 50Hz to 10kHz at +20dBu output (80kHz bandwidth) into 600 ohms. EIN better than: -125dBu @ 60dB gain.